Interesting clouds over Fremantle this morning and a chance of a shower tomorrow, according to BOM. 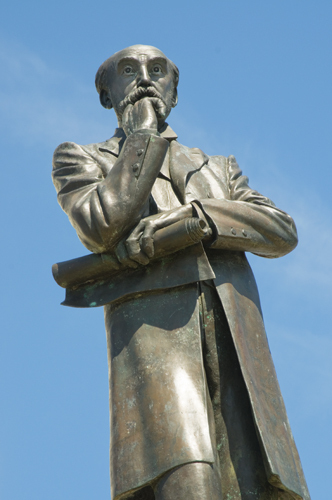 Even the great Charles Yelverton O’Connor appears concerned about the plans for Fremantle Port. Fremantle Councillor Jon Strachan alerted me to the presentation by WA Treasurer Mike Nahan to the Chamber of Commerce and Industry yesterday, where he told the 100 strong crowd that the Passenger Terminal and all land to the east of it at South Wharf would not be part of the sale of Fremantle Port. The land would developed by an MRA-style project management group and also allow for community access to the area west of the railway bridge. Under the present buffer zone rules around Fremantle Ports that land could not be developed for residential use and I wonder if that would be a great idea anyway as it is very close to train noise. Where would they put the new passenger terminal though? Would it be part of the contract with those who lease the port for 49 years to build a new passenger terminal west of the present one, closer to the CBD and how would that be enforced, or would it have to be part of the new development and even further away from the CBD? I doubt it would be considered to be safe to let the massive cruise ships turn around so close to the old traffic bridge though so a new passenger terminal would more likely be near the present Rottnest ferry terminal at B Shed. There is possibly a need for a new and stronger railway bridge in the future and also for a new traffic bridge with more lanes, so any development in the area needs to be done with that in mind. It looks like FREMANTLE PORTS is getting everything in shape for the asset fire sale by State Government. Painters are working on the port tower and were busy at the A and B Sheds last week. Quite surprisingly they have also started on extending Peter Hughes Drive, that was planned to go all the way to Cliff Street as part of the Victoria Quay integrated development with the Phillimore Street and railway station upgrade. C.Y O’Connor is a very important person to remember on W.A. Day and because the State coffers are empty Premier Colin Barnett has had another pipe dream about how to get drinking water to Perth. This time it’s not going to be a canal from the Kimberley but, to avoid expensive cost for desalination, we will now be pumping water from Kalgoorlie to Perth along the CY O’Connor pipeline. That would have made a good April’s Fool joke and of course I only invented it. P.S. Why is there no WA DAY event in Fremantle, but for meditation and Tai Chi at the Esplanade tomorrow? Can I suggest that next year we do the biggest ever barbeque, where people bring their own BBQs to the Esplanade, or the lawn at the Round House and we can have a very Freo celebration. SEE WHY C.Y. IS SO IMPORTANT TO W.A. Engineer Charles Yelverton O’Connor is a very important man in Fremantle’s and Western Australia’s history. He created Fremantle Harbour and built the Perth to Kalgoorlie water pipeline. Sadly he killed himself at South Beach. On Friday artist Jo Darvall will honour C.Y. when her exhibition C.Y.O’Connor-Myth&Legacy opens at the Moores Building Contemporary Arts Centre in Henry Street. Walking the Pipeline to the Waters End will be the first in a series of three shows. For all who love history and art, this should be a great show, especially since Darvall also refers to Sidney Nolan and Ned Kelly in her work. It is good to see that FREMANTLE PORTS is supporting the FREOPEDIA QR code project conceived by the Fremantle Society. The first five plaques have been installed there and look great. They will give visitors and locals the opportunity to read historic information about sites, buildings, monuments, etc. on their smartphones. All it needs is to download a free QR App. Nearly 70 Freopedia plaques have now been installed around Freo, including at Monument Hill, Notre Dame University and the City of Fremantle. Many more articles about Fremantle are stored on Wikipedia, so all it needs is for the Society to get funding to get more plaques manufactured..
Fremantle Ports is to be congratulated for the thorough public consultation workshops and the excellent work by Kieran Wong and associates of CODA architects. The Fremantle Society is excited about the opportunities the planned development of Victoria Quay (VQ) offer. This is a great chance to acknowledge the historic significance of the port and celebrate the importance of C.Y.O’Connor as one of Western Australia’s outstanding achievers for his role in building the harbour and the Perth to Kalgoorlie water pipeline. A modern Victoria Quay gives us the opportunity to interact with the local Wadjuk indigenous people through a cultural centre where visitors can experience the culture and history of the traditional custodians, take part in story telling and music events, purchase art and sample bush tucker. VQ should showcase the significance of the wharfs and the labour movement and should also show the extensive photographic historic collection Fremantle Ports has. A Migrant Museum telling the stories of the thousands who arrived on ships would also become an important attraction for any new development. The Fremantle Society believes VQ should become a 24 hour destination for locals and visitors alike, so it is essential that the mix of office, leisure, retail, entertainment, tourism, parking facilities is carefully balanced and managed. A day time ‘village’ that becomes a night time ghost town is not acceptable and neither is a shopping centre like precinct. Better and increased connectivity between VQ and the Fremantle CBD is a priority as is the connectivity between VQ and Bathers Beach/Fishing Boat Harbour. VQ should not compete with what inner city Fremantle already offers, and what it will offer more off once Planning Scheme Amendment 49 becomes active, instead VQ should become exemplary in its difference, while blending in with the human scale Fremantle is loved for by tourists and residents. The quality of the space and its use need to be authentic. The tenancies need to be for real commercial purpose and any retail needs to be of a very high standard. As a destination and attraction Fremantle Ports needs to encourage operators such as the people behind Little Creatures to develop unique, quality and authentic offerings on the wharf. Buildings of different shapes that are reflective of the elements of the area, and of different heights are essential to make the area attractive, as are public open spaces, public roof gardens with harbour views, green spaces and ‘activity pockets’ for children. Existing historic buildings need to be carefully integrated in any development and while relocation might be the easy option more creative solutions need to be encouraged to allow the buildings to remain as an historic cluster. The lack of significant public green spaces in the inner city and in the vicinity of the port means that erecting buildings on historic Pioneer Park should not be considered, instead the park should become one of the major attractions of the area. The park has been under utilised predominantly because it is not very attractive. This can and should be improved as part of the VQ development. The Fremantle Society believes an ‘Urban Scale’ approach to development at VQ is the best way forward to develop Fremantle. Building heights need to be varied so bland sameness is avoided. It would be prudent to vary building heights from 15 metres to 25 metres at maximum heights just below that of the Maritime Museum, which is 29 metres high. It is important not to ‘dwarf’ the heritage Railway Station with huge buildings overshadowing it. The railway forecourt needs to be improved and become far more attractive than it is at present. This will require relocation of the bus port to the East and remodelling to improve the passenger to bus interface and the efficiency of the overall intermodal exchange. With this movement to the East the forecourt can become a meeting and relaxation place and present a proper entrance to Fremantle. VQ has got it all; a working port is highly attractive. People love watching ships arrive and depart and they love watching sunsets. The close vicinity to the CBD and public transport makes it even more attractive to developers and retailers and those in the hospitality and tourism industries. It is not hard to envisage VQ as a highly attractive very Freo destination with a great mix of culture, art, heritage, entertainment, retail and offices. It does however require creativity and restraint. There needs to be recognition in the lot layout and alignment, in building design and utilisation that the development is integrated into the CBD, and although new and to some extent an extension of the West End, it has the elements of Fremantle’s bold building design, albeit circa 2020, not 1880. Fremantle Ports should resist the temptation of over development for financial gain. It is essential that development in the area absolutely acknowledges and embraces the sense of place of Fremantle and its unique character and lifestyle. The Fremantle Society is keen to see outstanding development of great architectural merit on Victoria Quay in the near future and we are offering Fremantle Ports to be part of the consultative process. I love Fremantle‘s working port. I love the coming and going of the large vessels, and sitting on the veranda of the old Pilot’s Cottage at Arthur Head one gets a great view day and night of the shipping movement in the harbour. C.Y O’Connor is the ‘harbour master’, as he oversees all the activity in Fremantle Port from his high vantage point. C.Y is the one who designed our port, so a very important man in the history of Western Australia. I took this photo at 7 am today when I walked out of the cottage to go and grab a coffee. I was stunned to hear last night at the Victoria Quay Planning and Design Forum that at a separate workshop a very large majority of Fremantle Notre Dame University architecture students had expressed that heritage was not an important consideration in their design planning for VQ. That is unbelievably ignorant and a lack of good education. The present connects the past to the future. History has made us who we are and gives us grounding and a sense of belonging. Without it we have no basis to base our values on. So how can heritage not be important to consider when one wants to develop our historic water front. The port was designed by one of Western Australia‘s very remarkable pioneers Charles Yelverton O’Connor, who also designed the water pipeline from Perth to Coolgardie. The C.Y O’Connor red brick building on Victoria Quay has close connections with former Australian Premier John Curtin, while the Labor history of the wharfies, the strikes, etc. are all part of our state’s and city’s history. How can that not be taking into account when one wants to modernise and revitalise Victoria Quay. How could it possibly be ignored by young students who show a serious lack of respect for the early settlers whose bravery, sacrifices and hardship made this state what it is. One only has to look at the tiny ships on which they came across the oceans to the other side of the earth. UNDA architecture students should all be required to do a stint on board the Duyfken or Leeuwin to experience the cramped conditions our ancestors had to endure. No doubt they won’t have to experience the hunger, violence, scurvy, etc. our early settlers did. There is also the Nyoongar heritage of the area that the UNDA students obviously also find irrelevant in their considerations on how to develop the south quay of Fremantle Port. The attitude of the students is pretty similar to those councillors and members of parliament who in the past said that the best thing for Fremantle was to bulldoze it and start from scratch. YEP, let’s just forget all that old rubbish and show the world how much cleverer we are than those who built before us. As a university Notre Dame have to seriously consider what is going on at their architecture department. The importance of heritage and respect for the past should be an essential part of education at that level. The attitude of the architecture students to ignore heritage in their deliberations is staggering! I can highly recommend UNDA’s passionate history professor Deborah Gare to do a few sessions with the architecture students. It would give them a real insight into their past. CORRECTION! Kierang Wong has responded to this post pointing out that the students were from a variety of disciplines as UNDA does not have an architecture department. Kieran also claims he said that the students had no or little understanding or keenness of the heritage area. My recollection of what he said differs from that and it became a topic of conversation with others after the forum. The extensive City of Fremantle art collection, the largest municipal art collection in the State, has finally found a new home and will move into the Fremantle Art Centre. The City of Fremantle Art Collection Gallery will host exhibitions of works selected from the collection, which contains over 1,300 artworks by over 500 artists. Many of the artists are W.A. or Freo locals. The first exhibition at the new gallery will be Everything Old Is New Again, of recently donated 20th century paintings by Kathleen O’Connor. Kathleen O’Connor was the third child of famous Fremantle engineer C.Y. O’Connor; and is one of Western Australia’s most respected modernist artists. O’Connor’s paintings will be shown alongside iconic historical and contemporary works by Fremantle artists George Haynes, Jane Martin, Alex Spremberg, Jeremy Kirwan-Ward and Helen Smith. Everything Old is New Again opens on Friday 18 May at 6.30pm, the same night as the much anticipated Shaun Tan exhibition Suburban Odyssey.